Utility-scale solar costs have reached new lows in the US, falling below $1 per watt in the first quarter of 2017. According to a new market insight report from America’s Solar Energy Industries Association (SEIA) and GTM Research, the record low price was achieved through surging growth of 145 percent in the utility sector in 2016, and the addition of over 2,000 MW(Megawatts) of new solar PV capacity since the start of this year. It should come as welcome news to Australian households, with ARENA chief Ivor Frischknecht recently telling a Senate Estimates panel that the price of utility-scale solar power here at home “come down dramatically” – falling to between $70 and $80 per MWh. “That’s below average National Electricity Market prices over the last year or so,” Mr Frischknect said. Renewable technologies like utility-scale solar PV are expected to benefit from major new investment under the Finkel Review’s Clean Energy Target for low emission sources of generation. Q1 2017 was the sixth consecutive quarter in which over two gigawatts of solar PV – classed as rooftop solar and commercial solar facilities – was installed, along with more than one gigawatt of utility-scale solar. Solar energy made up 30 percent of new capacity additions to come online in the first quarter – natural gas accounted for 41 percent, and wind was 27 percent. 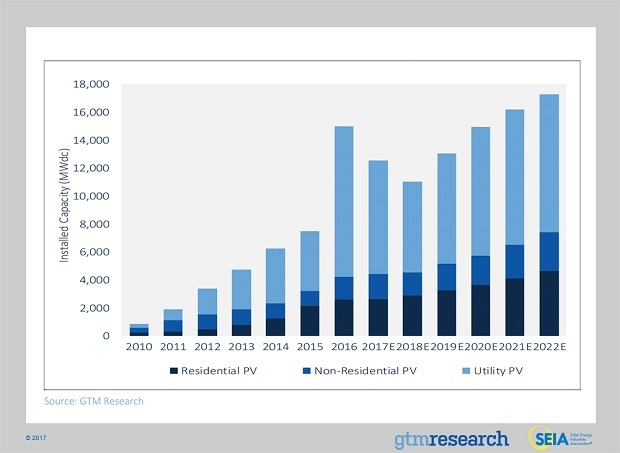 The report says both residential and non-residential solar markets are expected to experience year-on-year growth, even as the quarterly numbers experience a drop from last year’s record-setting pace. 12.6 GW of new PV installations are forecast in 2017, down 16 percent on 2016. More than half the new PV installed during Q1 was fixed-tilt utility-scale solar power. This led to the price of utility-scale systems dipping under the $1/watt barrier for the first time.